Though a relatively late starter in the world of virtual currencies, Coinigy.com is a legitimate site, which passes the first few criteria of our “scam filter” almost at first glance. It’s easy to view the operation as a legitimate one, since it doesn’t offer anything that’s too good to be true, and it doesn’t dangle the possibility of making fabulous sums of money with a minor cash investment, like cryptocurrency scams usually do. Indeed, Coinigy is not about cloud mining or Bitcoin mining in any shape or form, nor does it feature a high-yield investment pyramid, or auto-trading. It brings a legitimate service to bear, one that – according to its own motto – people will wonder how they ever lived without. What exactly does Coinigy offer? Launched in early 2015, the service was essentially a multi-trading platform, which offered access to some 15 crypto currency exchanges. It centralized data, and it laid it all out in an easy-to-digest format, through a visually appealing dashboard, which offered superb charting and equally impressive order-execution. The reason why we speak of the above in past tense is that since, Coinigy’s capabilities have been substantially upgraded. Now, digital currency traders can access more than 45 exchanges, and the platform has been updated in several other regards as well. An Android version has been launched too, allowing Bitcoin traders to have a 360 degree view of all their exchange accounts and access to a variety of charting/trading solutions in the palm of their hands. The Coinigy platform is a cloud-based one, and it never holds any of the users’ funds, so its security is bullet-proof. Just to be on the safe-side, it also uses two-factor authentication. All that sounds reassuring and impressive, but what exactly does Coinigy deliver to you, the small-time, retail Bitcoin trader? To start with, it makes trading possible directly off the chart, a feature the true virtues of which are brought into full effect by the fact that Coinigy features some 75+ technical indicators too. Such indicators are great for short-term trading, and they work for all the exchanges supported by Coinigy. Low-latency data feeds make sure that the prices featured by the platform are accurate. Traders can choose to receive a number of price-related alerts, in their browsers, as well as through email and SMS. To round out the offer, third-party app integration is also possible. Traders can add Google Sheets, as well as a number of Crypto tickers to their Coinigy accounts. The social scanner filters out crypto currency mentions from social media chatter and the chart scanner facilitates the quick and easy location of unique trading setups. To make it all better, there’s a free trial feature too, that allows traders to slowly dip into this seemingly intimidating sea of trading features, which can indeed take a while to master. Coinigy currently supports Bitcoin, Litecoin and Ripple. Available cryptocurrency pairs on the Coinigy trading platform include LTC/BTC, XRP/BTC, BTC/EUR, LTC/EUR, XRP/EUR, BTC/USD, EUR/USD, LTC/USD and XRP/USD. Based in Milwaukee, at 310 E Buffalo Street, Suite 120, Coinigy’s phone number is +1.414.301.2289. One of the founders, and the president of the operation is William Kehl. The other founder and CEO is Robert Borden. 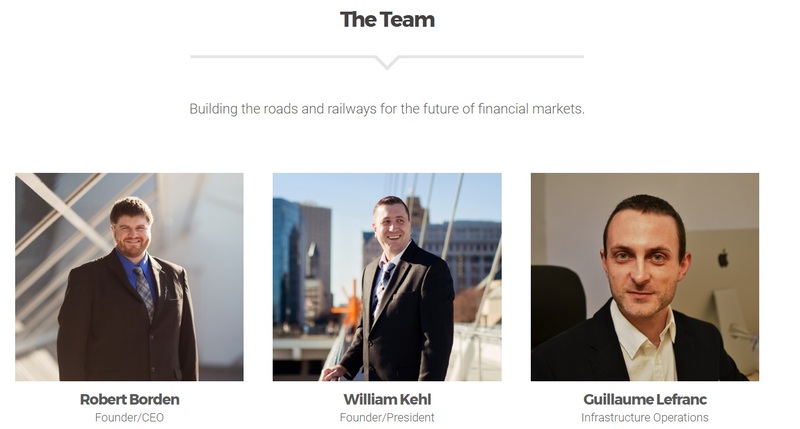 As you can see in the above image, the About Us page features photos of every one of the management team members, so there’s full transparency in this regard. The community chatter regarding the services offered by Coinigy is overwhelmingly positive. We didn’t actually come across a single negative post regarding the operation. At bitcointalk.org, the thread dedicated to Coinigy is mostly taken up by thanks from community members for the features brought about by the platform. Many have stated that they are simply addicted to the platform and they need to find ways to spend less time on it. The first post in the said thread was made by a Coinigy spokesperson, who started off by listing the features offered by the platform, on February 2, 2015. Most of the bitcointalk posts about the platform seem to be limited to 2015 though. Over at reddit, the community seems a tad more reserved regarding the advantages offered by Coinigy, but the bottom line over there too is that the service is useful. There have also been some complaints regarding the pairings used by Coinigy’s Arbmatrix feature, but nothing major, so it’s safe to conclude that Coinigy is well-regarded across the crypto community board. Needless to say, the coinigy.com domain registration information is public. The registrant is William Kehl and the domain has been registered in December, 2013. The registrant’s address is the same as the above detailed corporate address. Phone numbers and other bits of information match as well. The global Alexa rank of Coinigy.com was 14,320 at the time of writing, which is very impressive indeed. Most of the website traffic seems to come from the US, where the local Alexa rank of the page is 6,044. Australia, India, France and the UK seem to be where the rest of the Coinigy traffic is mostly drawn from. The domain authority rank of the site is 31/100, which is indeed decent. It also carries a 2/17 spam ranking though. The page authority is 40/100. Several of the top industry participants link to the site, so its backlink profile is indeed natural and healthy. The Coinigy reviews posted by various crypto currency portals are all positive. The point of debate in these reviews doesn’t concern legitimacy. It’s mostly about whether Coinigy is indeed the best such platform, or if there are better alternatives. Coinigy is indeed a genuine, legitimate crypto currency trading application, which offers its users access to a wide selection of exchanges, trading tools, technical analysis indicators and third-party apps. Nothing about the Coinigy pitch is even remotely suspicious. There’s full transparency in regards to every single aspect of the operation. Is it the best such solution out there? That’s debatable, but it is very close to the top indeed. What’s your opinion about Coinigy? Let us know by commenting below. Actually Coinigy is an excellent solution to use as a front end to trade on multiple exchanges all in one place. The problem I was having had to do with adjusting the screen viewing size on my laptop. It was very frustrating until Coinigy tech support helped me figure it out. It was a combination of cockpit error on my part and peaks in the traffic volume that has affected everyone in the world of crypto. Have you found other viable options? Did you found a better crypto trading platform ? I have not had a good experience at Coinigy so far. Sketchy AI based support. Confusing tutorials teach on screens and links that are not actually available to the subscribers. A bit of a bait and switch in my opinion. Especially since they quote a month subscription rate but then clip for 12 months all front in advance. I am still trying to get them explain the missing buttons and links which are on tutorials but nowhere to be found on the actual site.